Comprehensive list of all things Quaker (Religious Society of Friends): meetings and churches, organizations, schools, writings, and much more. "An association of members of the Society of Friends with a special sense of unity in the concern for distribution of sound Quaker literature." All tracts are free to copy and distribute. Includes some very nice pictures. Read about Friends from the point of view of a University of Virginia sociology of religion student; history, theology, and links. Profiles of lots of other sects (and "cults") as well. Usually meets once a year, in conjunction with the joint annual meetings of the American Academy of Religion and the Society for Biblical Literature. All are welcome to attend! Short alphabetical list of Quaker vocabulary. French and English glossary of Quaker terms. 1599 edition of the Geneva Bible with commentary that was included in the editions in common use in Fox’s time. An influential Bible version for early Friends. A comprehensive Scripture index to early Quaker writings. A work in progress. Including links to Yearly Meeting books of Faith and Practice. Notice the theological concepts these groups use to explain what they're about. Important late-19th century statement intended to promote unity among Friends. 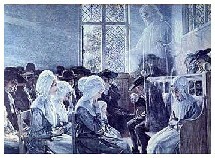 Fox, "Principles of the Quakers"
Full title: "Some Principles of the Elect People of God Who in Scorn are called Quakers, For all People throughout all Christendome to Read over, and thereby their own States to Consider." By George Fox, the 17th century English principal founder. An early forerunner of books of Quaker "Faith and Practice." By George Fox and others. Often used as proof of Fox's mainstream Christian orthodoxy. Most folks nowadays use Dean Freiday's edition of the Apology, "In Modern English." This one is NOT in Modern English, which makes it useful for word searches and so forth. "Vocal Ministry and the Bible"
Information from a workshop given at the FGC "Nurturing the Meeting Community" Conference, Rosholt, Wisconsin, September 19-22, 2002. Paper written for the World Council of Churches, explaining Quaker decision-making practice and its theological presuppositions. By Eden Grace, a member of New England Yearly Meeting and the Quaker member of the WCC Central Committee. The WCC is beginning a shift from Parliamentary procedure to consensus decision-making, after being strongly urged to do so by both the Orthodox churches and the African churches. Eden serves on a Special Commission charged with restructuring the WCC, including its decision making procedures, and was asked to present this paper to a meeting in Damascus Syria in March 2000. Margaret Fell, "Women's Speaking Justified"
From her Quaker Strongholds (1890). "What Can the Bible Teach Us About Peacemaking?" Article in QUEST Issue 4 by Ron Mock of George Fox University in Newberg, Oregon. Two parts: "What can the Bible teach us?" and "about peace." Catalog of Quaker Writings of the 17th, 18th, & 19th Centuries Currently in Print or Online. Compiled by Licia and Larry Kuenning. Includes Peter Sippel's online anthology of Friends writings and links to other Friends' sites. "Aims to make available various historical Quaker writings that have been allowed to go out of print." The complete Works of early Friend Isaac Penington. Writings of controversial early Friend James Nayler. The Rufus Jones edition of Fox's Journal (called Autobiography on the title page). 18th century Friend Woolman's Journal. William Penn: "Some Fruits of Solitude"
John Wilbur "On the Holy Scriptures"
"1st. Can the Scriptures, or did they ever, save any one without the spirit? 2nd. Is a person called to the work of the ministry by the Scriptures, or by the spirit of Jesus Christ? 3rd. Is a man brought under a concern to go from one place to another to preach the gospel, by the Scriptures, or by the constraining power of the spirit and love of Jesus Christ? 4th. And when he is arrived at the place assigned, and is assembled with the people, is it not the spirit of Christ that truly unfolds the Scriptures, and brings to view the state of men, either in the words of Scripture, or in some other suitable language? 5th. And when a professed minister preaches in any of our meetings, his doctrines not being repugnant to the letter of the Scriptures, are the elders or others to judge by the Scriptures, or by the Spirit of Truth, whether his ministry is from the right spring or not? 6th. Did not the Jews think they had eternal life in the Scriptures, and yet would not come unto Christ that they might have life?" "Eden Grace is a member of Beacon Hill Friends Meeting, New England Yearly Meeting (Religious Society of Friends), in Boston Massachusetts. Since 1998, she has been serving as the Quaker member of the Central Committee of the World Council of Churches. She is also active with the Massachusetts Council of Churches, with Friends United Meeting, and with several other Quaker organizations.... Eden seeks to promote Christian faithfulness among Quakers, and to work toward Christian unity and reconciliation for the sake of Christ’s mission in the world." "The Mystery of Christ Within"
Article by Michael Hatfield of Austin Christian Friends Worship Group, from Quaker Life. A wonderful example of Friends way of engaging scripture, finding ourselves in the text. "A Quaker Understanding of Jesus Christ"
Article by Arthur O. Roberts, originally published in Quaker Religious Thought, July 1999. By Larry Kuenning. The complete texts of the John Bunyan, Edward Burrough, and George Fox documents pertinent to their 17th century doctrinal debate, with web links enabling the reader to trace quotations and misquotations to the specific passage in the sources, as well as Larry's dissertation on the subject. "Discerning Ministry and Gifts "
By Marty Grundy. Discusses issues of religious authority, particularly corporately within meetings. Part of the Fall 1998 Pendle Hill Monday Night Lecture Series, "Challenging Some Quaker Assumptions." "What Can We Proclaim As One? Certainty & Uncertainty"
By Jonathon Vogel-Borne. Part of the Fall 1998 Pendle Hill Monday Night Lecture Series, "Challenging Some Quaker Assumptions"
"Quaker Culture vs. Quaker Faith: The Time Has Come to Choose"
By Samuel D. Caldwell. Part of the Fall 1998 Pendle Hill Monday Night Lecture Series, "Challenging Some Quaker Assumptions." Includes the online journal Quaker Theology, edited by Chuck Fager and Ann Riggs. "Friends (Quakers) and the Bible"
Excellent overview by Bill Samuel; includes links to primary documents. "Friends' Ecclesiology and The Quaker-Wide Web"
Recent article by Chuck Fager exploring how Friends "do church" in primarily biblical terms; from a liberal perspective. Short article by Bill Samuel. Interesting narrative and pictures about Pacific Yearly Meeting and Friends on the west coast of the United States. 800-966-4556 (9 AM-4:30 PM EST). Online library of FGC publications. Includes the full text of Fostering Vital Friends Meetings available for download. Affiliated with Friends United Meeting (FUM). Includes Online Book Catalog. Downloadable (pdf) catalog with some selections online. 800-742-3150 ext. 2. Affiliated with Friends United Meeting (FUM). Includes a nice Short List of Recommended Reading about Quakerism.